In an era of globalization and Internet commoditization, salespeople are in danger of becoming irrelevant. In this Darwinian environment, the traditional approach of selling solutions to problems no longer creates profitable differentiation. To survive, salespeople must become agents of change and help customers achieve their goals rather than simply solve their problems. This new, change-centric approach is the next evolution in selling, enabling companies to develop deeper, more profitable customer relationships and to be more agile and adaptive to changing conditions. 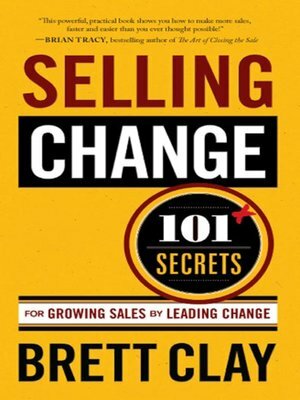 With twenty years of experience, most recently with Microsoft, Brett Clay has developed a complete toolset for change-centric salespeople, including 101 secrets for growing sales and delivering high value to customers. Readers will understand the five disciplines of change leadership and the secrets of change psychology that will turn them into vital assets for their customers and help them achieve explosive sales growth.